Premier League Manager betting: Could Rodgers be a perfect fit for Leicester? Alex Keble argues that Brendan Rodgers might be getting frustrated at Celtic, and that he is the ideal replacement for Claude Puel at Leicester City. "Leicester is also the perfect size for a Rodgers project. His failure to land the Arsenal job, or even come close, shows he needs to prove himself again in the Premier League before a top job in Europe is within reach. Leicester is arguably the biggest outside the top six; they consistently spend big money on young players (Rodgers has a history of promoting youth) and would no doubt back him in January." The day before Celtic's league match against Hearts, on August 10, manager Brendan Rodgers reiterated it was a "joy" to work at the club despite their failure to land long-time target John McGinn from Hibernian. He also warned - but not in a tone to worry the board - that if the club didn't constantly seek to improve that, "My job is done. Terminado. Gone." A shock 1-0 defeat to Hearts forced the manager to confirm he wouldn't be walking away despite a disappointing transfer window, and then came Tuesday's 2-1 loss away at AEK Athens, sending Celtic out of the Champions League. It's "not rocket science" Rodgers said after the game. "It's pretty obvious, you have to keep progressing." The tone had clearly shifted. The former Liverpool manager did reaffirm his commitment to the club, but one could hardly expect anything else from a coach in a post-game interview. In reality, Rodgers must be beginning to wonder whether - with Celtic stalling in the transfer market and unable or unwilling to build on his success -now is a good time to jump ship. After completing a double treble in Glasgow, he won't be short of offers. 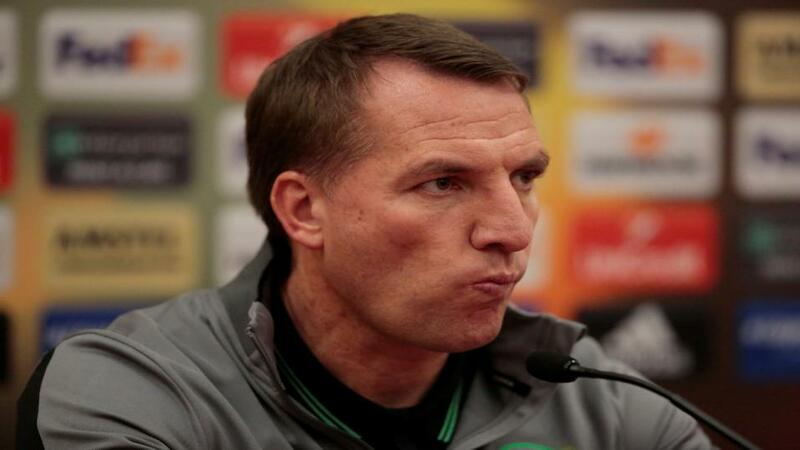 If progress really is the key to Rodgers' happiness at Celtic then he'd better not hang around much longer. The departure of Stuart Armstrong to Southampton hasn't gone down well while Dedryck Boyata is reportedly refusing to train in the hope of forcing a move to Sevilla. What's more, having seen McGinn slip through his fingers, Rodgers now faces competition from Premier League clubs for Manchester City's Olivier Ntcham. Celtic apparently just don't have the pulling power to keep building, something that could get even worse now they have fallen into the Europa League. The BBC calculate that Celtic will miss out on at least £11 million of income this season as a consequence, which is bound to affect their ability to sign new recruits. Tensions are mounting in Glasgow with most fans blaming the board rather than Rodgers, although either way the increasingly pessimistic atmosphere could trigger the 45-year-old's exit. After all, what else can he realistically achieve at the club? In two years he has won every major Scottish trophy available, completing an invincilble season in 2016/17 and performing at least to expectations in the Champions League group stages. His job may very well "be done". Unlikely to walk, Rodgers may wait for a big Premier League job to come along, and should the Daily Mirror's report last week prove correct that could happen in the next fortnight. On August 11, Tom Hopkinson reported that Puel has just two games to save his job with Roberto Martinez and/or Thierry Henry lined up to replace him. Puel has never been a popular figure at Leicester largely because of the cautious and prosaic football he preaches in the Midlands, something Southampton fans frequently complained about before he was fired at the end of the 2016/17 campaign. The dissenting voices at Leicester intensifed towards the end of last season as the Foxes won just three of their final 14 league games, slumping to a ninth-place finish. In fact, as early as April the Telegraph reported his job was hanging by a thread because the atmosphere was "severely strained", leaving "a number of disillusioned players". From a boardroom perspective sacking Puel now would be a bizarre business decision: why keep him throughout the summer if a single defeat against Manchester United is enough to lose faith? The pre-season months of tactics, training, and transfers will have been wasted - and yet the rumour appears to hold water. After all, the board have been silent since the report emerged four days ago. The Northern Irishman's expansive possession-focused football is precisely what the Foxes board have been searching for and the main reason why they appointed Puel in the first place. However, unlike the current Leicester boss Rodgers is entertaining both personally and in terms of the tactics he preaches - even if his motivational techniques leave him looking less like Jurgen Klopp and more like a 'chilled-out entertainer'. Leicester is also the perfect size for a Rodgers project. His failure to land the Arsenal job, or even come close, shows he needs to prove himself again in the Premier League before a top job in Europe is within reach. Leicester is arguably the biggest outside the top six; they consistently spend big money on young players (Rodgers has a history of promoting youth) and would no doubt back him in January. He is about the biggest name Leicester could hope to appoint, too, making it an ideal fit for both parties. Even if Puel survives another few months he seems certain to lose his job before the season is out and Rodgers doesn't seem in a particular hurry to get away from Celtic Park. Those 6/1 odds should drop as the season wears on. Belgium's coaching pair Martinez and Henry are the current favourites thanks to the the Mirror's report, and while the former is of a similar style and stature to Rodgers the latter would be a huge gamble on his own. The sudden availability of Rodgers (the reported shortlist was drawn up before Celtic's defeats to Hearts and AEK) probably pushes Henry down the pecking order. Martinez may not want the job. Unlike Rodgers at Celtic, Martinez's reputation can continue to grow athis current post, with big things expected now Belgium have won a bronze medal at a World Cup finals. The Red Devils are currently fourth favourites to win Euro 2020: another semi-final appearance or better could put Martinez in line for a role in England, Spain, Germany, or Italy that offers Champions League football. If the Spaniard sees things that way, Rodgers has a clear run at landing the Leicester job.